Every developer is interested in quick code and at the same time, does not want to compromise on the quality of code. Visual Studio provides some tools using which developers can achieve these goals. IntelliTrace is one such tool which can reduce the time taken for debugging an application. 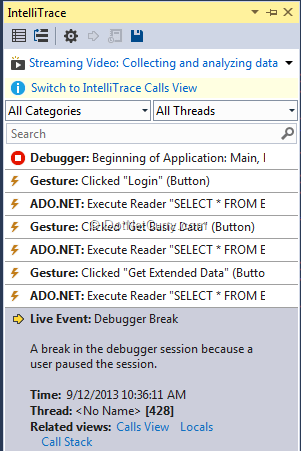 Visual Studio 2010 provided this fabulous debugging tool with the Ultimate version. This tool collects data about an application while it is executing. The collected data can be stored with the help of an “.iTrace” file. 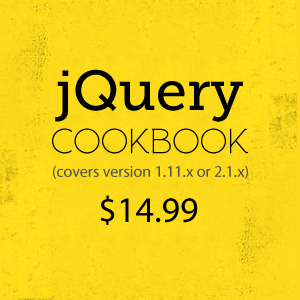 This collected information can then be useful to the developer or her/his colleague for debugging. Many a times a bug that the developer receives, does not provide the steps to reproduce the problem encountered by the tester. With the help of Microsoft Test Manager (MTM), a bug work item can be created with IntelliTrace data which can be used by the developer to understand the exact problem. 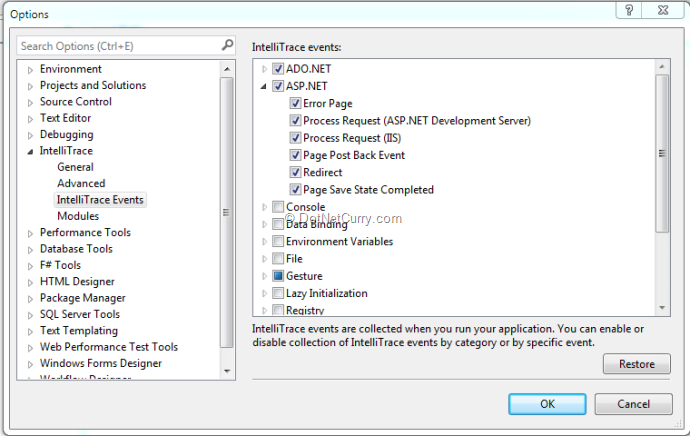 Visual Studio 2012 provided IntelliTrace in production environment so that without having any of the development tools installed on the server, it became possible to collect IntelliTrace data. In this article, we will find out how IntelliTrace can be effectively used to find the right information at the right time, continue to debug the application and maintain high quality code. In the next article I will discuss how IntelliTrace can be enabled using Microsoft Test Manager and also how it can be applied in a production environment. Observe there are 4 tabs for IntelliTrace namely General, Advanced, IntelliTrace Events and Modules. Each of these tabs provides different functionality. Default behavior is to collect only IntelliTrace events information. If the calls and events information is captured, a lot of information will be gathered, but the application performance will also be hampered. With “Advanced” tab we can specify the location of “.iTrace” file and also adjust the size of it. 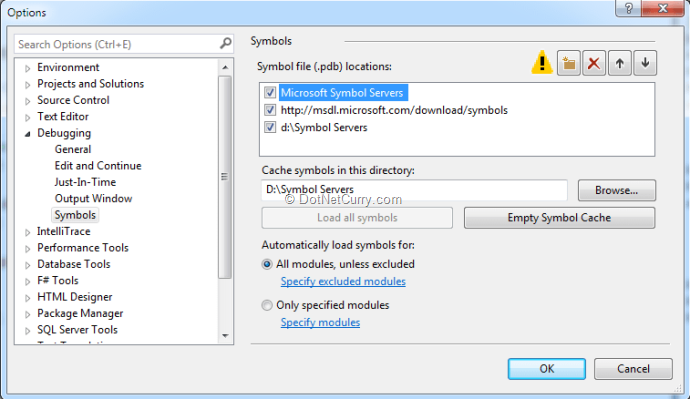 The IntelliTrace file gets automatically deleted when the instance of Visual Studio is closed. 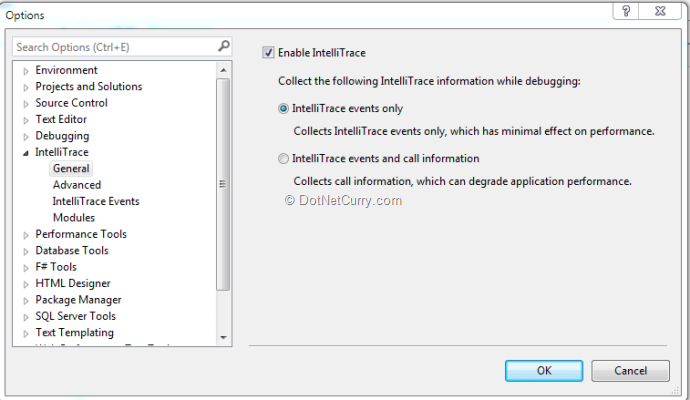 “IntelliTrace Events” tab provides the list of all events to collect data for. When we are debugging any Web Application ASP.NET, such related events can be useful. If we set a breakpoint in the application while running, we can get calls as well as events information of the application we are executing. This will give us a complete history, as if we are debugging the application. 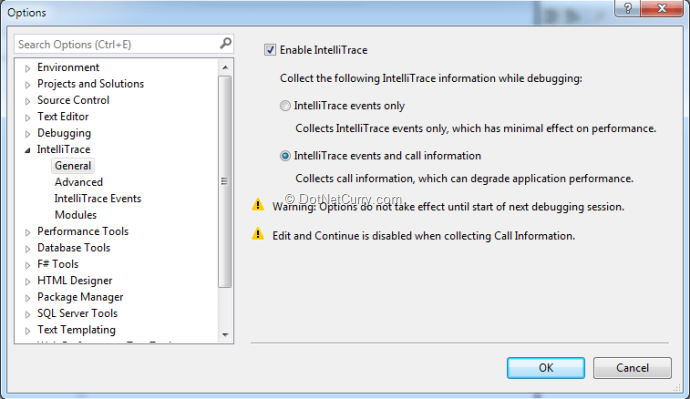 In a debugger break, we can view the IntelliTrace calls view as follows. Observe we can also switch to Events View. All the events which we had configured will be captured. We can view Locals window as well as call stack. In Locals windows, we can observe the execute reader command as well as command text and connection string values. In call stack, we can observe the complete stack. It gives us all the functionality for debugging like step in, step out, go to previous call or next call as can be seen from the image (see yellow arrow to the left of above image). Comment box is shown for uname variable. IntelliTrace shows us values of basic variables, however complex variables values are not persisted. 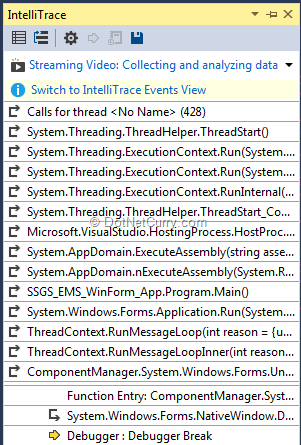 So we just saw how IntelliTrace in Visual Studio 2013 helps in understanding the problem and also provides complete debugging information so that quality of the code can be maintained. In the next article, we will observe how IntelliTrace file can be collected using Microsoft Test Manager and also how IntelliTrace can be applied in a production environment. This article does not explain how intellitrace is useful. It was a waste of my time to read this.